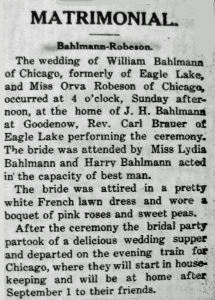 The wedding of William Bahlmann of Chicago, formerly of Eagle Lake, and Miss Ora Robinson of Chicago, occurred at 4 o’clock, Sunday afternoon, at the home of J.H. 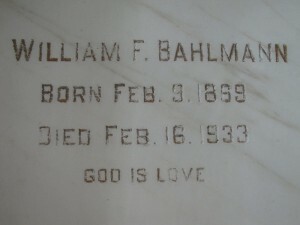 Bahlmann at Goodenow, Rev. Carl Brauer of Eagle Lake performing the ceremony. The bride was attended by Miss Lena Bahlman, and Henry Bahlmann acted in the capacity of best man. The bride was attired in a pretty white French lawn dress and wore a bouquet of pink roses and sweet peas. After the ceremony, the bridal party partook of a delicious wedding supper and departed on the evening train for Chicago, where they will start housekeeping and will be at home after September 1 to their friends. William F. Bahlmann died at his home in Chicago, last Thursday, of heart trouble at the age of 64 years, 7 days. 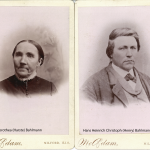 Mr. Bahlmann was born at Eagle Lake, Feb. 9, 1869 and spent his early life with his parents on a farm there. He later took up barbering, which trade he followed for several years at Cissna Park before removing to Chicago. About 32 years ago he entered the open Board of Trade, of which he was a broker until his death. He was married to Miss Ora M. Robinson in August, 1908. Besides the widow he leaves to mourn his untimely death, a son, William, Jr., a daughter-in-law, one brother, Henry F., and one sister, Miss Lena Bahlman, of Cissna Park. 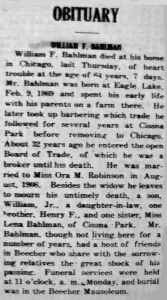 Mr. Bahlman, though not living here for a number of years, has a host of friends in Beecher who share with the sorrowing relatives the great shock of his passing. 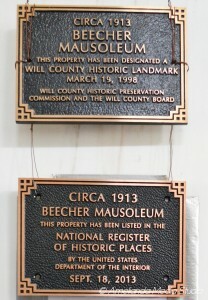 Funeral services were held at 11 o’clock, a.m., Monday, and burial was in the Beecher Mausoleum. This entry was posted in Automated Burial Listing, Burial Listing, HEADSTONE, Obituaries- Have Full Copy, St. John Evangelical Lutheran Church - Eagle Lake by Sandra. Bookmark the permalink. William was my Grandfather (William F. 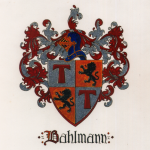 Bahlmann,Jr., his son, was my father). William Jr. died in 1987 (complications from cancer) and is buried in King William County Virginia (near Richmond where I was born August 10,1939). I currently reside in Muncie, IN and would be happy to be of assistance in the restoration/preservation of the mausoleum.